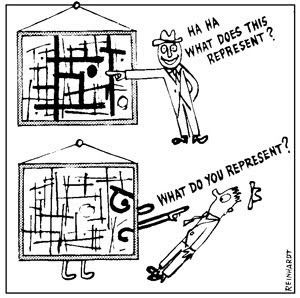 "An avant-garde in art advances art-as-art or it isn't avant-garde" (Ad Reinhardt). Ad Reinhardt’s aims as a maker of images seems rather removed from my attachment to what could be called the romantic or spiritual in visual culture. Reinhardt’s art “moved from geometrical abstraction through a controlled and markedly impersonal form of Abstract Expressionism into a uniquely concentrated and super elegant geometrical abstraction. 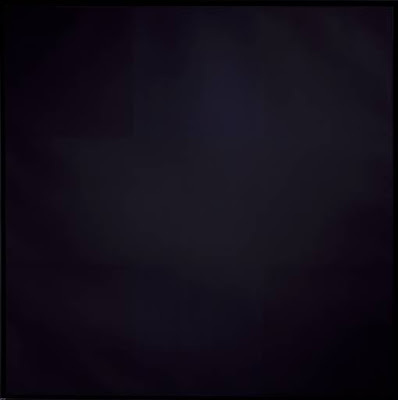 From 1960 until his death in 1967 he painted nothing but square canvases of one size in which two barely distinguishable coats of black present a cruciform trisection of the surface” (Lynton, N., 2003, p.244). In 1960 Reinhardt explains his aims as a painter: "Nowhere in world art has it been clearer than in Asia that anything irrational, momentary, spontaneous, unconscious, primitive, expressionist, accidental or informal, cannot be called serious art. Only blankness, complete awareness, disinterestedness; the ‘artist as artist’ only, of one and rational mind, ‘vacant and spiritual’, empty and marvellous; in symmetries and regularities only; the changeless ‘human content’, the timeless ‘supreme principle’, the ageless ‘universal formula for art, nothing else" (Lynton, N., 2003 p.244). Ad Reinhardt in his essay “Art as Art” argued against art-as-expression or art-as-apocalypse. “Art”, he argued “needs no justification with ‘realism’ or ‘naturalism,’ ‘regionalism’ or ‘nationalism,’ individualism’ or ‘socialism,’ or any other ideas” (Reinhardt, A., 1992 p.806). “The one standard in art”, he suggests “is oneness and fineness, rightness and purity, abstractness and evanescence. The one thing to say about art is its breathlessness, lifelessness, deathlessness, contentlessness, formlessness, spacelessness and timelessness. This is always the end of art” (Reinhardt, A., 1992 p.806). Harrison, C. and Wood, P., (1992) Art in Theory 1900-1990: An Anthology of Changing Ideas, Oxford: Blackwells. Reinhardt, Ad (1962) "Art as Art" in Harrison, C. and Wood, P., (1992) Art in Theory 1900-1990: An Anthology of Changing Ideas, Oxford: Blackwells, pp.806-809.